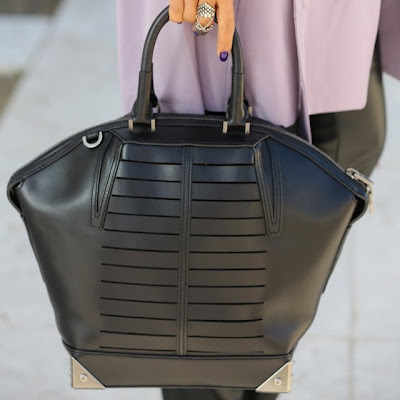 Alexander Wang knows how hip urban girls want to accessorize - take this Emile tote, which is the perfect fusion of downtown cool and functionality. Crafted from super luxe textured-leather or suede and highlighted by metal hardware, this semi-structured bag will stamp any outfit with instant style status. Note the optional shoulder strap to keep hands free on busy city days, too. San Francisco native Alexander Wang attended Parsons The New School for Design in New York (where he still resides and maintains his studio), but left his sophomore year to launch his ready-to-wear collection in 2007. He has since garnered an impressive list of awards, including being chosen as the recipient of the Vogue/CFDA Fashion Fund in 2008. His designs exhibit a spirit of relaxed sophistication and downtown chic. Emile tote has chic trapezoid silhouette and it is roomy enough for all your essentials. Polished metal feet protect the bottom and allow the bag to stand on its own. Double rolled handles and detachable shoulder strap. A zip opens to the lined interior with 3 pockets. Metal plates and leather panels structure the Alexander Wang Emile tote with innovative geometry. This design from fashion's wunderkind has both top handles and a shoulder strap, so you can carry it two ways. With tough-talking designs like this Emile bag, it’s easy to see why Alexander Wang has fast become synonymous with the effortlessly cool set of New York. And since Google Reader is retiring by July 1, 2013; and I probably can't keep up with your feeds from my reading list; I'll keep in touch with you via Bloglovin' by then. Followed you now on Bloglovin' too. What a great bag! I love how stylish it is! I like this type of bag! Love Alexander Wang! What a heavy name this bag has..!